Naval Hospital Jacksonville celebrates Aug. 1- 7 as well as showcases their World Health Organization/United Nations Children’s Fund Baby Friendly Certification. Breastfeeding benefits babies and moms and is considered by many to be a miracle food with advantages that cannot be duplicated. In multiple studies, breastfeeding has been shown to be the one thing that can prevent the most cases of infant hospitalization and death. The breast milk itself changes over time to meet the baby’s needs during specific developmental periods. Studies from all over the world have show that it is easier to digest than formula and contains substances such as hormones, probiotics and antibodies that protect babies from illness. 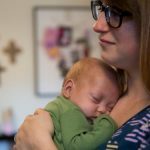 At Naval Hospital Jacksonville, we recommend and assist mothers with exclusive breastfeeding for the first six months of their babies’ lives, and until 12 months or longer with the addition of appropriate foods. Studies from all over the world have shown that breastfed babies have decreased episodes of vomiting and diarrhea, lower respiratory tract illnesses, ear infections, obesity, asthma, obesity and type 2 diabetes. Some research also indicates that breastfed babies may have less type I diabetes, childhood leukemia, allergies and sudden infant death syndrome. Breast milk is also readily available in cases of natural disaster or other emergencies. Mothers also benefit from breastfeeding their babies. Women experience less blood loss after delivery and their level of stress hormones are lower. They have a decreased risk for developing breast cancer, ovarian cancer and postpartum depression, and may have less type 2 diabetes. Financially, it is estimated that infant formula and the necessary supplies costs at least $1,500 during the first 12 months. Mothers who work outside the home and breastfeed also miss less work because their babies are healthier. Society also benefits from increased breastfeeding rates. It is estimated that if 90 percent of infants in the United States were breastfed exclusively for six months that nearly 1,000 deaths could be prevented and $13 billion would be saved. Breastfeeding is better for the environment as breast milk requires no complex processing, packaging or shipping like formula.